Pfaltzgraff dinnerware sets are popular in the dinnerware world. Possibly, the most popular Pfaltzgraff dinnerware patterns currently consist of the Pfaltzgraff Filigree dinnerware set , the Pfaltzgraff Pistoulet dinnerware set , the Yorktowne dinnerware set and Pfaltzgraff Rio dinnerware . Retired Pfaltzgraff patterns are also in demand. This company has been producing dinnerware since 1811. They do a good job of keeping up with the trends of home décor, which always makes their dinnerware patterns contemporary and fashionable. Pfaltzgraff dinnerware is known for producing casual dinnerware sets. Most are ceramic, some of stoneware, and acrylic and melamine dinnerware sets are among them. There is no way that I can list all of the dinnerware sets made by Pfaltzgraff, so here are a few of their most popular patterns to give you an idea of their style of dinnerware. To see more, feel free to visit the Pfaltzgraff Online Dinnerware Outlet . 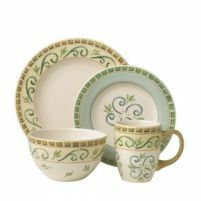 Pfaltzgraff is also known for producing beautiful casual dinnerware sets with holiday themes. The Plymouth pattern is very popular for Thanksgiving dinnerware and the Winterberry pattern is perfect for Christmas dinnerware. These patterns are ideal for hosting a holiday dinner. From time to time, Pfaltzgraff releases new patterns, so this dinnerware manufacturer is always a good place to look for trendy dinnerware that fits your style of décor. If you are looking for retired patterns or replacement pieces, eBay is always a good place to shop. Also, replacement companies often collect a variety of Pfaltzgraff retired patterns and you can usually make up a complete dinnerware set through them.